1 How Casino Dice Are Made? How Casino Dice Are Made? Casino dice are also called ‘precision dice’. This is due to the fact that they’re made with perfect precision and exact dimensions. They usually come in the color red but some of them can also come in the colors blue, green, and purple. Changing a die just a little bit can have a significant effect on the randomness of its outcome when rolled. This is why each die undergoes complex and perfectly calculated processes. This is how they can ensure its randomness and uniqueness. Casino dice are manufactured very differently from regular dice. Rather than molded, these dice are machined. Molded dice are not as evenly distributed as machine-manufactured dice. When manufacturing casino dice, federally mandated tolerances should be observed. Machine-manufactured dice are precisely made. The pips’ holes are drilled into the dice. Then, they’ll be filled with a colored substance that has the exact same density of the plastic before the dice was drilled. This will ensure that all sides will weigh exactly the same. Cheating the outcome of the dice is a common occurrence at casinos. 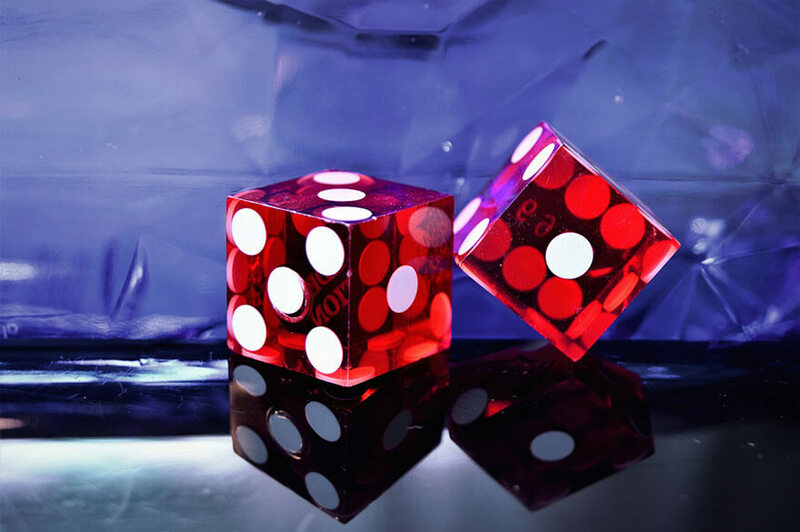 To prevent players from successfully cheating their way through a game, casinos came up with security measures to ensure the randomness of the outcome of casino dice and to prevent players from forging the dice used for the games. Cancelling means placing a circular marking on the surface of dice. This will help dealers identify if already cancelled dice will be used by a player during a game. Casino dice are also called precision dice for a reason. They are made into perfect cubes so it will be hard for people to create identical dice. Each dimension of dice must be accurate to within 0.0005 of an inch, making them extremely precise. Tables used at casinos have textured bumps. They are also called alligator bumpers or pyramid bumpers. The presence of diamond rubber bumpers will make it hard for a cheating player to manipulate the outcome of the casino dice. Hardly noticeable and it’s a great strategy to identify fake dice from real ones. Some casinos fill the dice’s pips with special epoxy. This will make the pips change their color when placed under UV light. Using a simple black light can help dealers find out if a casino dice is real or fake. Casinos started putting a serial number on each die to prevent fake ones from being used in the game. These casino dice usually come in packs of five with the same serial number. If one of the dice being used in the game has a different serial number, the dealer will know that one of them is a fake. While the regular dice have rounded corners, casino dice have sharp ones. Rolls using dice with rounded corners make it not truly random. Casino dice with sharp corners result into rolls which are guaranteed to be random. Since the 1950s, casino dice have been translucent. The component responsible for the dice’s translucency is cellulose acetate. A transparent die is easier to check if anyone has altered it. To make it harder for people to imitate the dice used for the game, casinos imprint their logos on them. Each casino logo has a unique identifier to discourage players from cheating though counterfeiting the dice. One effective strategy to prevent cheating is through constantly changing dice throughout the day. Every four to eight hours, fresh and new dice are brought into the game. Dice tampering will be prevented with this security measure. It must be noted that casinos have the right to change dice anytime they like. Instead of just being painted on dice, pips are drilled into casino dice. This will make sure that even the side with six pips weighs the same as the side with only one pip.